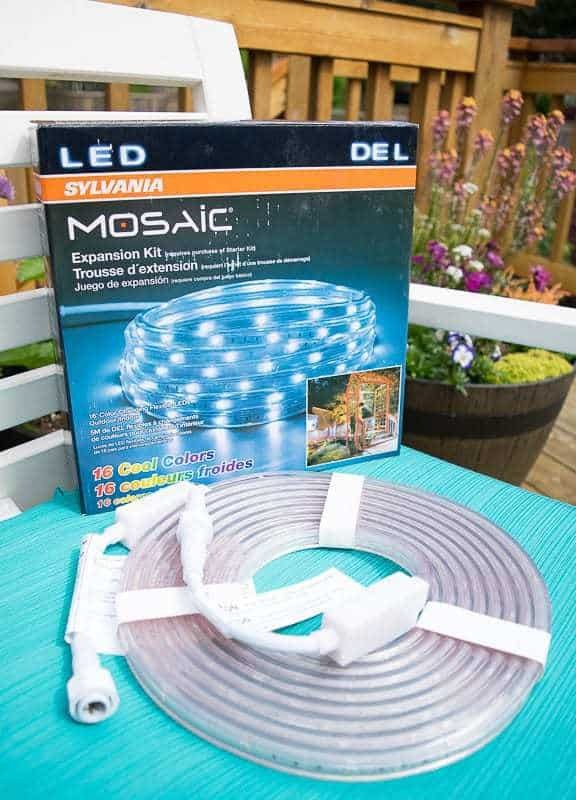 Get the party started this summer with outdoor rope lights! 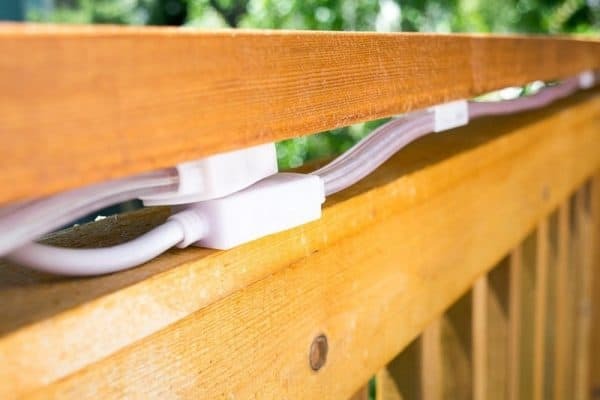 Installing rope lights to the underside of your deck railing is an easy upgrade that gives your outdoor space instant ambiance when the sun goes down! 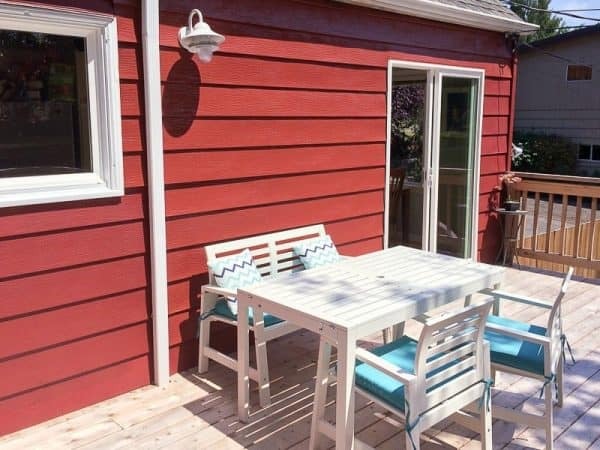 It’s time to hose down the patio set, get the outdoor cushions out of storage, and have ourselves a barbecue on the deck! Memorial Day is the unofficial start to summer, but the sun goes down far too early in May. 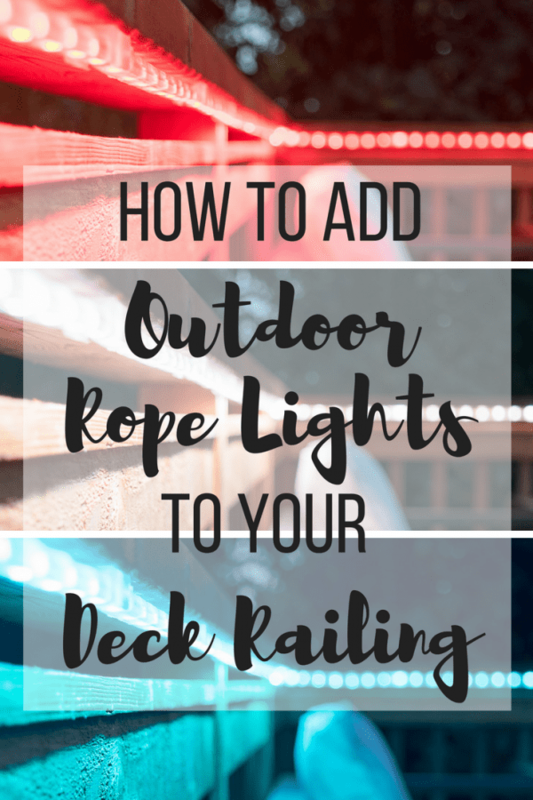 This year, we’re keeping the party going into the night by adding outdoor rope lights to the deck railing. 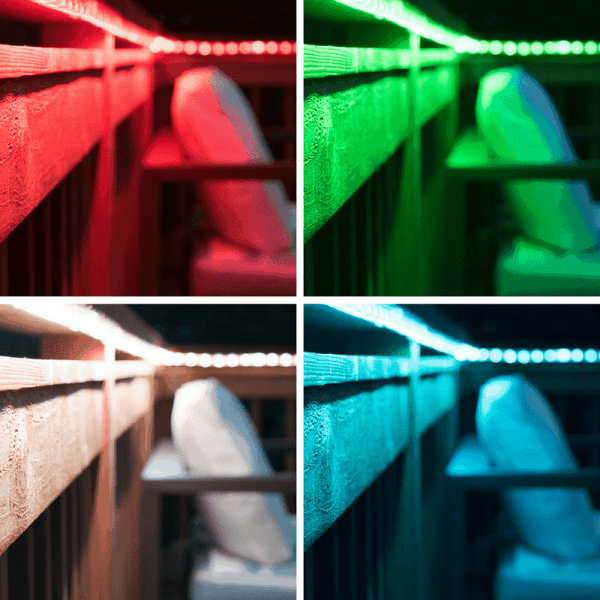 The ambient glow will illuminate the perimeter and give the space a festive atmosphere with color-changing LEDs! This post is sponsored by Batteries Plus Bulbs and contains affiliate links. Purchases made through these links may earn me a small commission at no additional cost to you. 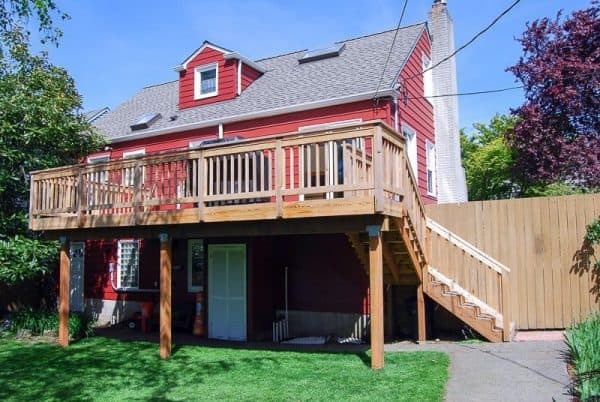 Our deck has been a work in progress since we moved to this house a few years ago. First, we had the deck completely rebuilt to double the size and remove the old, rotting version. After allowing it to weather for six months, I wasted invested a week of my summer staining every inch. The deck is due for another coat this year, and I’m not looking forward to it! I redid the stain on the top railing before installing these outdoor rope lights, which is why it doesn’t match in the installation photos. 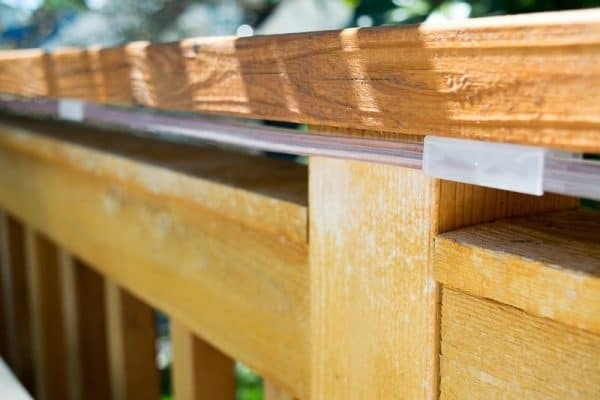 There are some bare patches on the lower rails from the deck cleaner. Finishing it is a project for another day . . . I built my own outdoor loveseat and sofa to create an inviting seating area in one corner. Check out the tutorial and download the free plans to make your own! 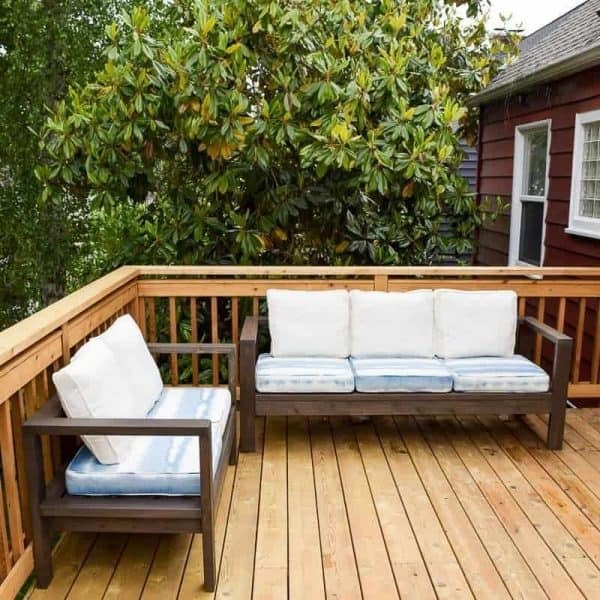 Once the sun dips behind our huge magnolia tree, the deck is hidden in shade and darkness. 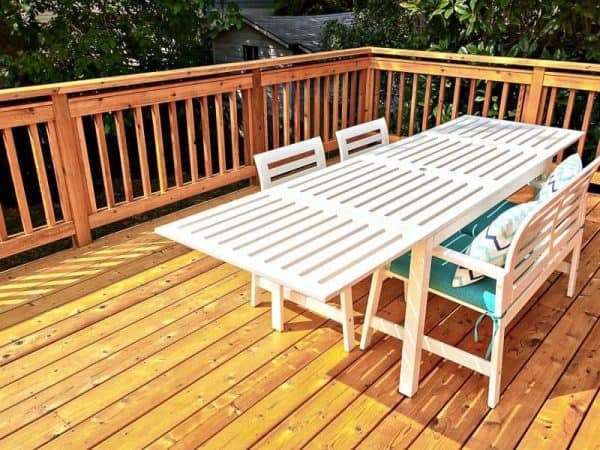 One lone light fixture over the table provides enough light to eat by, but doesn’t reach to the far corners of the deck. Luckily, the good people over at Batteries Plus Bulbs are here to help! May is National Home Improvement Month, and they’ve got everything you need to give your home the lighting and power it requires. Lawn mower batteries? Check! 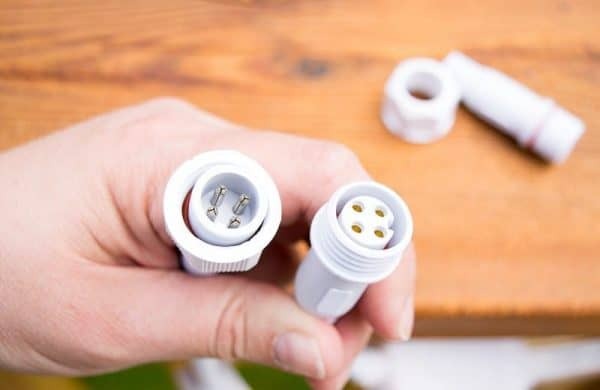 That strangely-shaped light bulb you can’t find a replacement for? Yup! 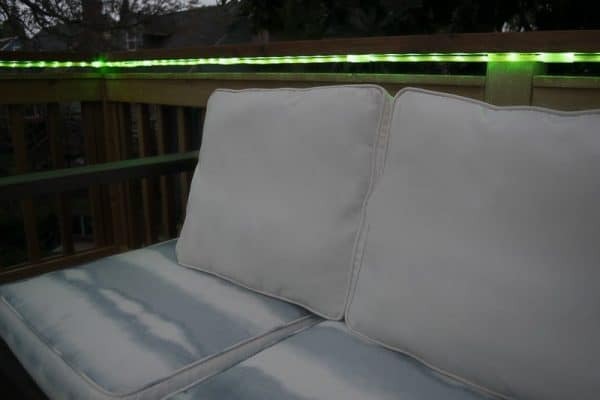 Color changing outdoor rope lights? Perfect! These LED outdoor rope lights are the ideal lighting solution for my deck. 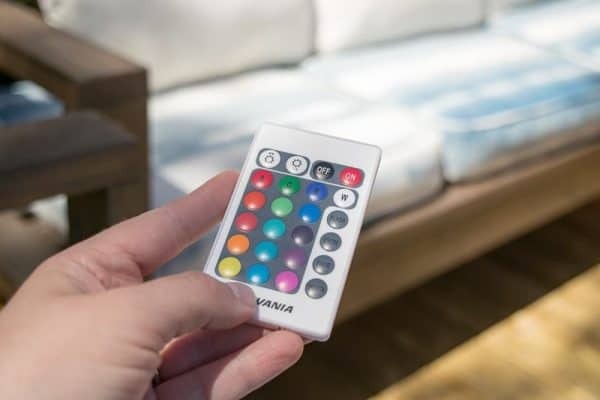 The kit comes with a remote control that can be used to change the color of the lights to suit the mood and season. From red/white/blue for Memorial Day and the Fourth of July, to red/green/blue for Christmas, and white for simple ambient light. Perfect for setting a festive party atmosphere! It took the base unit with 16 feet of lights, plus two expansion kits to wrap around the entire deck and down the stairs. 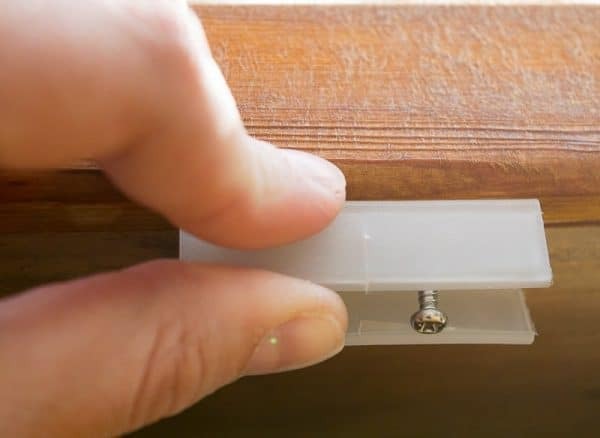 Each box comes with the mounting hardware required to attach it to the railing. If you’re looking for simple white outdoor rope lights, I would go with this cheaper option. No power outlet nearby? Try these solar rope lights instead! 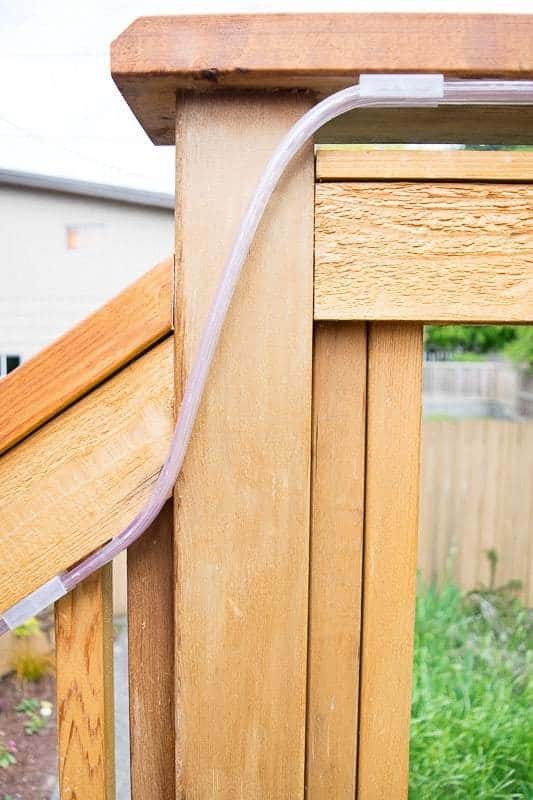 These adhesive clips would make it easy to attach to the underside of your deck railing. Installation was pretty straightforward. I started the screws in the bracket holes to make it easier to drill upside down without losing them in the grass below. 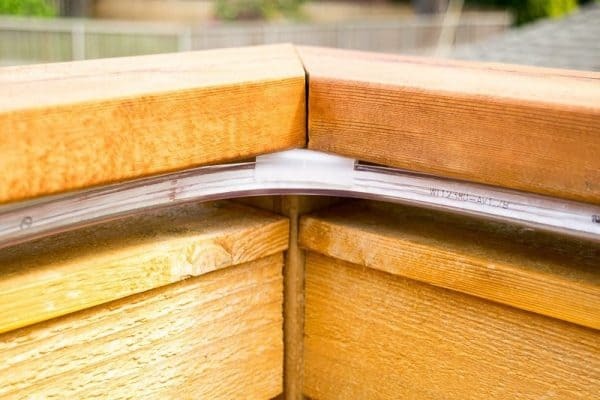 The overhang was just wide enough to attach the brackets underneath. Once the mounting hardware is in place, the outdoor rope lights pop right in. The next bracket should be about 18″ away so the lights don’t sag. Connecting additional light strips is easy! Just remove the cap from one end, insert it into the other, and tighten the ring around the junction. Arranging the power bricks at the beginning and end of each rope light segment took a bit of trial and error. I didn’t want to lose the effect of a solid string of lights, but there’s almost a two foot gap between the end of one string and the beginning of the next. I decided to stack the two power bricks together so that the line of lights was as close to uninterrupted as I could get. They’re hidden under the railing, so you only see them when they’re at eye level. The corners posed another challenge. These outdoor rope lights aren’t flexible enough to make a 90 degree turn. I installed a bracket across the corner and used it to simply hold the curve of the lights in place rather than click it fully into the hardware. Where the deck railing meets the stairs down to the backyard, I played around with it until I found a curve that worked well, and installed the brackets accordingly. I was excited for nightfall to arrive so I could get the full effect of the lights. The wait was totally worth it! It turned out exactly as I envisioned! 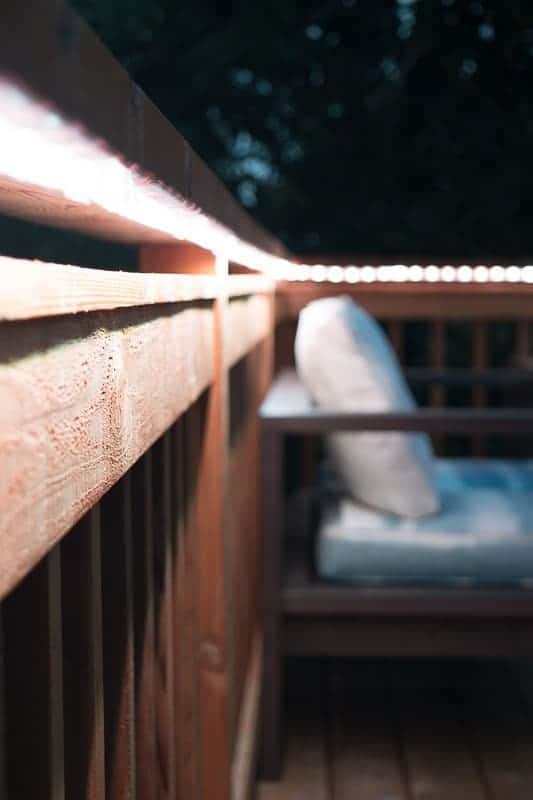 The lights give the perimeter of the deck the perfect glow, and changing the color changes the mood of the space. Check out the video to see my favorites! If you would like to keep up to date with my latest posts about outdoor projects, home decor and more, you can follow me on Facebook, Pinterest, or Instagram. You can also sign up for my email list below for updates sent straight to your inbox! Love that these are colour changing, I need to get some. Very cool look – I especially like the classic white light look on the deck. What a cool addition to your deck. We just made the ver our deck and I was thinking of adding more ambient lighting. This would be perfect. I love outdoor lighting and these rope lights are so much fun! That remote is everything! I love this. So cool and relaxing looking. Lighting always adds a special touch to any outdoor space. Thanks for sharing the how to’s with SYC.